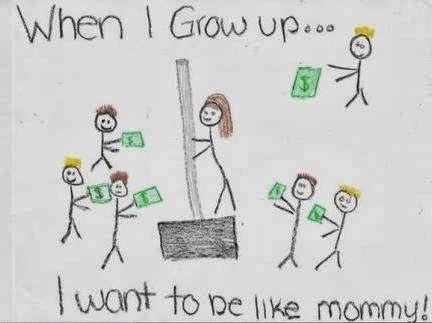 Matt Mikalatos: My parents sent me this email about pole dancing. It made me laugh. My parents sent me this email about pole dancing. It made me laugh. Here's the email they sent me. I want to be perfectly clear on my child's homework illustration. It is NOT of me on a dance pole on a stage in a strip joint surrounded by male customers with money. I work at Home Depot and had commented to my daughter how much money we made in the recent snowstorm. This drawing is of me selling a snow shovel.